The afterlife has long been a source of fascination for storytellers. Ancient myths describe golden fields or a place in the clouds. But what if the afterlife and technology are closely linked? 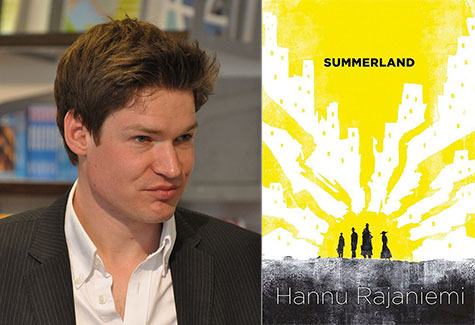 Hannu Rajaniemi explores an afterlife that allows for communication via radio waves in his new novel. In Summerland, it’s the 1930’s. The east and the west are at odds and people in the afterlife can chat with the living via a radio link. This makes the afterlife a key part of any country’s secret intelligence plan. The British Secret Service have extended their reach into Summerland, a giant ethereal city of the recently deceased. In classic espionage fashion, the Soviet Union has also infiltrated Summerland and it’s up to SIS Agent Rachel White to catch a mole within the cadre of agents floating around in the afterlife. With signature ingenuity and excitement, Rajaniemi provides a whole new twist on the familiar spy genre. Rajaniemi is the author of numerous novels and short stories. He’s won a number of awards for his Jean le Flambeur series of novels. Summerland, is out this June from Tor Books. The following interview was transcribed and edited for clarity. When did you realize that you wanted to write science fiction? I realized I wanted to start writing when I moved to Edinburgh to do my PhD. I had this background of doing tabletop and live-action role-playing games in Finland and then lost touch with that community when I moved to the UK to work on my thesis. I wanted to do something creative so initially, I tried theater and played a French psychopath in a student production. Then, I ended up going to a reading featuring a number of writers and recognized author, Charlie Stross. He wasn’t quite as famous back then, but I’d read his story “Lobsters.” The whole group that performed turned out to be quite excellent and I thought that writing short stories could be kind of interesting. I ended up joining the group. You write both in English and Finnish. How has this impacted your storytelling? Actually, I don’t write much in Finnish anymore although I would like to. Because I started writing fiction in Edinburgh, it was all in English. Otherwise, I wouldn’t have been able to get feedback from the writers’ group. In a way, that sort of helped me initially because even though I didn’t have an instinctive mastery or fluency of a native speaker, it somehow made it easier to accept criticism. Having that one degree of distance from the text actually made it easier to edit and accept feedback, which I found somewhat helpful. A bit later, I did write a couple of short stories in Finnish and it was a different process. Certain things did come more naturally but I also found myself a lot sloppier in Finnish and I had to edit more. Finnish and English are just very, very different languages. In Finnish, it’s easy to make up new words and string them together to make compound words, which makes it a nice language for science fiction and fantasy. Whereas in English, you probably have the exact right word already out there because the vocabulary is so vast. I somehow lost that attention to detail writing fiction in Finnish. I also had the opportunity to translate those stories into English and some stories from English into Finnish. There are different textures and the ways to use words, especially in the science fictional context. Right now, because of time demands, I mainly do write for the English-speaking market. I’ve also had the weird experience of having my books translated into Finnish by somebody other than me, which has been a fascinating process. I’ve been lucky enough to have great translators. Reading those translations was definitely a strange experience. I think there’s a lot of ourselves defined by the language we speak and quite a lot of multilingual people describe their English-speaking self and native-language self as different. I think there’s something to that. My Finnish-speaking self is the friends and family self, whereas in all professional settings I’m one hundred percent English speaking. It was a bit strange to see those two domains mixing. How has architecture blogger Geoff Manaugh influenced your writing? That mostly applies to the Jean le Flambeur books. There are a lot of little individual ideas that came from his blogs. For example: there was an article featuring algorithmically generated sculptures. I ended up using that idea of transforming digital data into a physical space. He has this fascination with cities and architecture as this physical expression of ideas. He also has quite a vivid writing style and does write in speculative mode about imaginary and large-scale architectures. All the Jean le Flambeur books and Summerland do feature strange cities and strange urban environments. The way Geoff thinks about weird space and how those spaces can embody cultural ideas I found helpful. How has it been departing from the Jean le Flambeur novels and venturing out into something new? It’s been great! It took a while because I had a break from novels coming out for a few years. Summerland definitely went through quite a few iterations and it took some time to get into an entirely different world, mind-set, and set of ideas. It was refreshing and, in a way, it taught me quite a lot about writing novels. Structurally, the three Jean le Flambeur books were one big novel. Writing Summerland required me to think hard about what actually goes into a novel and made me think about how to write a different kind of novel. It was a challenge, but quite an exciting one. Why do you think the afterlife is such an alluring topic for writers? It is one of those universal human obsessions. It features not just in fiction but in mythology and in many actual belief systems and religions. What fascinates me is how our relationship with technology and science has changed our view of the afterlife. You can see that very vividly right now in Silicon Valley where you have many tech companies actively working on life extension, with many people seriously trying to figure out how to transfer our brains into digital form. That sort of recasting the afterlife in technological terms has happened before. The last time it happened in an interesting way was in the late 19th century and early 20th century. The initial impulse was Darwinism, removing humans from the center of the universe and giving intellectuals serious doubt about the existence of god and the afterlife and having to grapple with the fact that if there’s no afterlife then what do we do with morality if there’s no stick and carrot to encourage people to behave properly. A lot of people seized upon spiritualism as a starting point to build some kind of scientifically comprehensive afterlife. They pulled in a lot of the ideas that were floating around in physics at the time like aether, the fourth dimension, the radio, and X-rays. Different thinkers went in different directions with it, but there is this clear phenomenon of people saying there might be a scientific way of explaining the afterlife. Sir Oliver Lodge was one of the pioneers of radio together with Marconi who speculated that with sufficiently advanced radio technology, he could actually speak to his dead son in the afterlife. I think what’s fascinating for me are the connections between technology and the afterlife. That’s the starting point for Summerland. We get an afterlife that allows us to talk to the dead via radio and that has fairly well defined scientific cosmology. You have a knack for describing complex and often ethereal ideas in your stories with structure and clarity. Did you find it difficult articulating your vision of the afterlife in this novel? There was a certain amount of iteration and deliberate worldbuilding there. In fiction you have this constraint of trying to craft a speculative element in such a way that it enhances the story or allows you to tell new kinds of stories. I think one of the key points in figuring out how to articulate the afterlife was realizing that it had to be a spy story. In a spy story you inherently have the notion that the world is full of secrets and we don’t know everything about the world and we don’t entirely understand how the world works. There are unseen forces at play and you can’t necessarily trust anybody. It’s a natural narrative framework to create that ethereal realm. Why does the Soviet Union always make the perfect adversary for a spy story? In Summerland, the Soviet Union is quite different from the real life Soviet Union. I chose it in the context of Summerland because the earlier revolution of Russia was deeply weird. You have this entire country deciding collectively that none of the old rules apply anymore, that we’re going to build this new society from scratch and anything goes. In real history, you had this group of revolutionaries that are called the God-Builders that decided that in order to keep the Soviet Union cohesive there needed to be some kind of religion. They set out to create this artificial religion where Lenin was a figurehead. Then they were planning to use replicas of Lenin’s tomb as a religious object in people’s homes. I used the Soviet Union in my novel because of those weird ideas from early revolutionary Russia. I think for spy stories in general it makes for a good monolithic mysterious adversary. There’s the Iron Curtain and you don’t know what’s behind it or necessarily know how these people think. How do you balance your scientific work, writing, and a mathematics company? Does it feel like you’re switching between disparate parts of your brain or does it all somehow weave together? My scientific work, such as it is, is in the context of a startup. I do contribute on the synthetic biology side of things. The two areas definitely feed into each other. Given that the current fiction project is biology based, there’s a strong connection between the two. It’s nice to treat writing as this meditative space in the morning that allows me to get away from the stress of the day job for a little bit. It acts as a mental cleansing space. I’ve jumped right into another story closer to my day job and hard science based. The next project has the working title of Dark Ome, which is a near future story about biohackers. A teenage girl joins an underground biohacker community to cure her little brother’s cancer and various strange things happen the more deeply she gets involved. It’s been interesting to talk to real life biohackers in the Bay Area who are experimenting with everything from genomic medicine to vaccines. One can see early seeds of the future unfolding here.